About $1B has been invested in early stage SaaS startups as of November 1. Over the last nine months, marketing startups have raised more dollars in aggregate than any other segment. 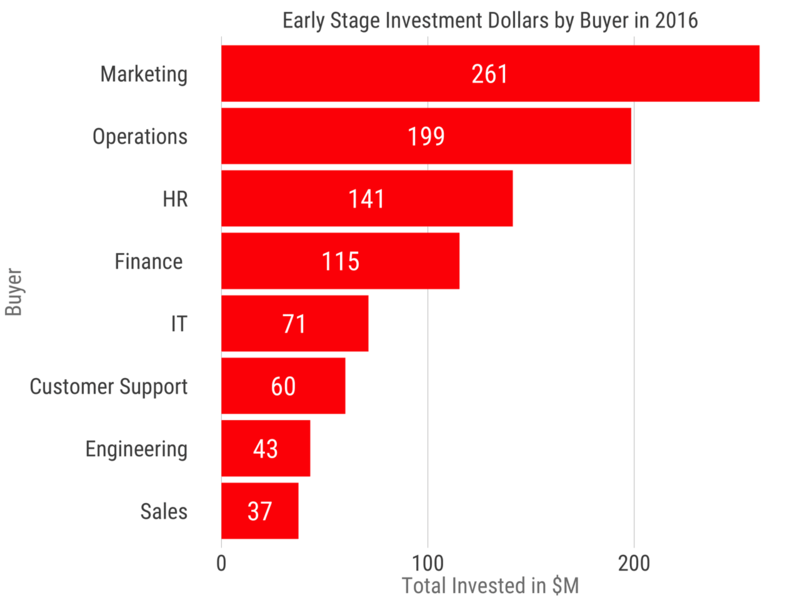 The chart above shows the early-stage investment dollars by buyer within the organization. Operations teams following second, with human resources focused startups in third. Notably, sales startups raised the least amount of capital. If we compare these trends to the total aggregate market capitalization of public SaaS companies by buyer, we observe a few interesting patterns. First, the emergence of an operations category. Operations focused startups tend to be vertical, they tend to focus on the specific task of a target customer. This could be helping farmers improve their yields or scientists perform experiments. This operations category hints at the rising importance in the fundraising market of vertical SaaS companies. In addition, startups focusing on selling to sales teams may be struggling amidst a very competitive and potentially saturated market. Marketing startups, on the other hand, seem to be thriving. An equally competitive category to sales, marketing has seen some consolidation this year with the acquisitions of Marketo and Constant Contact, among others. In addition, there were quite a few analytics companies raising capital this year. Series A round sizes certainly had quite a bit of variance. The median so far as $8.1M, with 25th percentile at $7M and 75th percentile just over $10M. 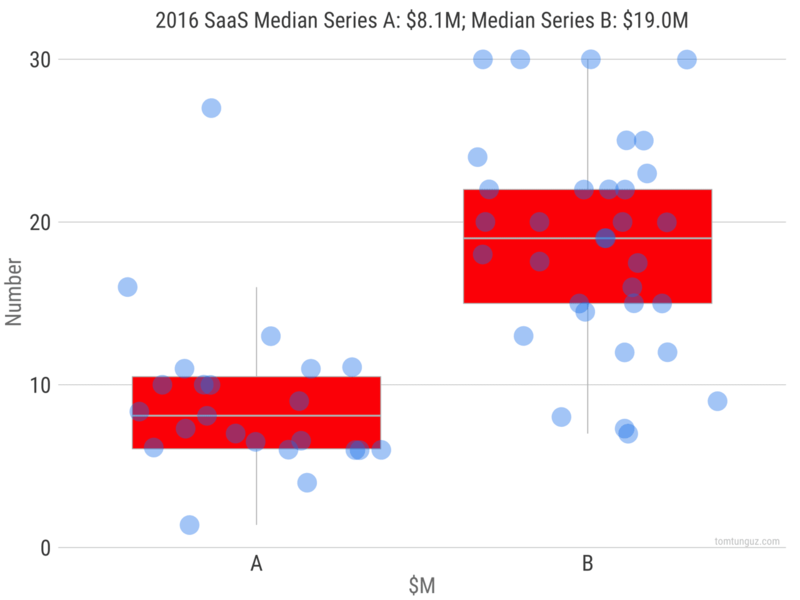 Series B medians were $19.0M with 25th percentile; 75th percentile at $22M. Series A investments totaled $207 million for the first nine months while series B investments touched $720 million. Let’s take a quick look at the breakdown between horizontal and vertical SaaS companies. In the Series A market, horizontal startups raised $149M compared to vertical startups at $59M. The median round size for vertical startups is $9.1M compared to $7.3M of horizontal startups. But that difference is not statistically significant. In the series B Market, the funding share was closer to even with $423M invested in horizontal companies and $297M in vertical ones. In this market, horizontal startups averaged a greater round size, but again the difference is not meaningful. It clear that the early-stage SaaS fundraising market is healthy despite all the vacillations in the public market. The exuberant acquisition environment should enable some early-stage companies to menace their incumbents and take share, as those behemoths are distracted by M&A. The increasing focus on vertical software startups shouldn’t be surprising. Many of the most of apparent and immediate opportunities in the software market have been filled by now SaaS incumbents. The systems of record for sales, customer support, marketing, human resources have turned over once already since the client/server days and in some categories twice. Meaningful innovation will be required to shift customers once more. 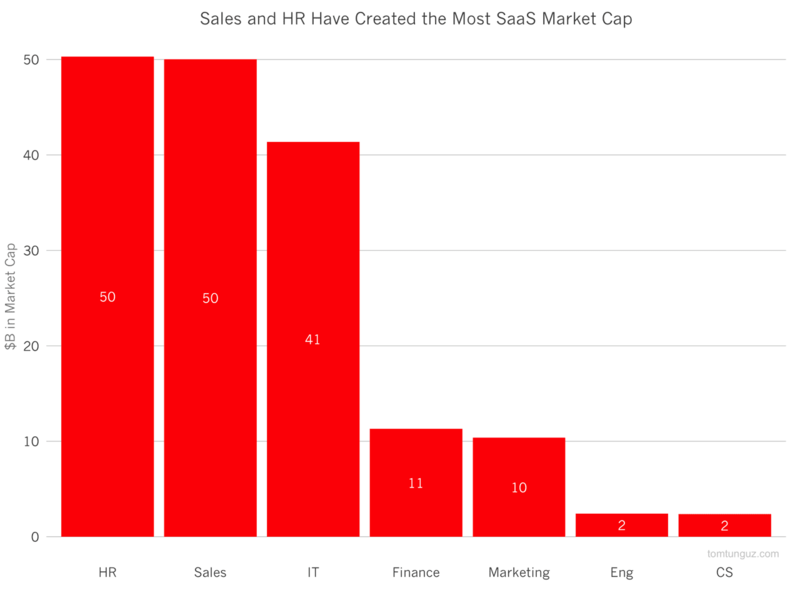 In contrast, SaaS has not yet come to many vertical categories and in some places DOS systems still pervade. These customers are hungry for novel software with similar user experiences to what they’ve become accustomed to on the web and their mobile phone. And investors are excited to support them. Artificial intelligence is to be a big trend in the SaaS world, a theme that matured in 2016 but will very much continue through 2017. 17% of SaaS companies who have raised so far in 2016 employ machine learning. Potentially, these new sets of technologies that have advanced speech recognition, image recognition, natural language processing, and anomaly detection will be enough to subvert the incumbent systems of record.